This kit allows you to install YJ springs under your CJ. YJ springs are .5" wider than stock CJ front springs and slightly longer. Updatind your CJ to YJ springs will improve the ride quality with larger improved bushings and less friction between leafs. Installation of YJ specific lift springs will increase the wheel base slightly over 1". Front and rear heavy duty greasable shackle hangers. 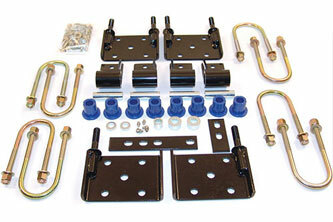 Front and rear spring mounting plates with u-bolts.